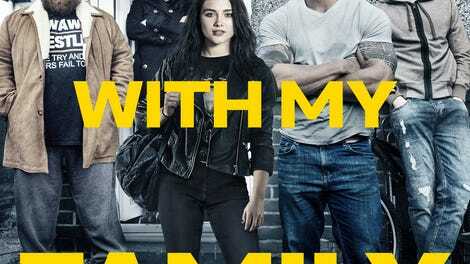 Fighting With My Family is a shamelessly formulaic sponsored post of a crowd-pleaser that’s also, in its best moments, a genuinely stirring celebration of chase-your-dreams moxie. It presents the Cinderella (origin) story of professional wrestler Paige with just enough scrappy naturalism—enough English working-class spirit—to distract from the familiarity of its sports-movie clichés and general function as an advertisement for a giant entertainment conglomerate. In these respects, it often feels attuned to the appeal of pro wrestling itself: You can watch the film, knowing full well that you’re seeing the dramatic equivalent of a fixed fight, and still get caught up in the blow-by-blow. Here, as in the ring, it all comes down to the performers, and their ability to show us the real in the fake. It’s a little surprising that it’s taken this long for the WWE to commission an official biopic for one of its stars. More unexpected still is the pedigree, the unlikely mix of talents, the studio brought together to get it made. The film’s been written and directed by Stephen Merchant, the English comedian who co-created The Office. And though WWE Studios mostly exists to generate Hollywood acting roles for its stable of athlete-entertainers, Merchant hasn’t cast the real Paige, a.k.a. Saraya-Jade Bevis, as herself. Instead, he’s handed the role to Florence Pugh, the young breakout star of Lady Macbeth, who’s already established herself as a regally poised costume-drama mainstay. She’s not the first person you might think of to play an earnest aspiring wrestler. And she doesn’t really look, sound, or carry herself like the WWE Divas Champion. But this, again, is pro wrestling we’re talking about. A little suspension of disbelief is very much in the spirit of the profession. And maybe there’s a certain paradoxical logic, true to a world of outsize roleplaying, in casting a fake Paige to show us the “real” one. Have fans gotten so attached to Bevis’ on-stage persona that they’d have trouble accepting her in character as her out-of-character self? Either way, Pugh is radiantly sympathetic as the pre-fame Saraya-Jade—and Fighting With My Family rests its whole cornball power on her wide-eyed sincerity. As Merchant’s script (re)tells it, with some light embellishments and elisions, Bevis was raised on wrestling, growing up performing in the amateur Norwich league founded by her parents, Julia “Sweet Saraya” (Lena Headey) and Patrick “Rowdy Ricky Knight” (Nick Frost). The star of this family operation was always Bevis’ older brother, Zak “Zodiac” (Jack Lowden, who looks a bit like if Simon Pegg had a handsome bruiser of a son). But when the two are jointly invited to audition for the WWE, only Saraya-Jade makes the cut. This is not, to be clear, a true warts-and-all look behind the scenes of pro wrestling. How could it be, with the federation fronting the bill? Fighting With My Family is at its least likable when it’s explicitly behaving like branded entertainment, openly presenting the WWE as a benevolent corporate entity, making dreams come true for the lucky few. There’s a two-scene cameo by The Rock, playing himself as an endlessly patient and warm-hearted fairy godfather, that’s so worshipful of him and the institution he’s shilling for that it actually threatens to undercut the star’s massive charm. The movie doesn’t need him. Not when it has Pugh lending bone-deep vulnerability to every moment, finding the emotional truth in a true story of rags-to-riches success. When Paige finally makes her big Raw debut, Merchant barely pretends to stick to script—ironically, he re-stages a staged showdown to make it look more suspenseful, and less certain in outcome, than it really was. But a little creative liberty is more than permissible. As any wrestling fan can tell you, a scene doesn’t have to be real to touch on something real.